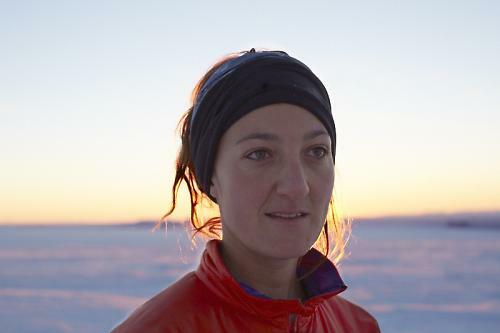 It’s over 400 miles from the edge of Antarctica to the South Pole, it’s likely to take 20 days or more, and it gets pretty parky down there by all accounts. Maria’s tool for the job is this tricycle from ICE Trikes, based in Falmouth, Cornwall. 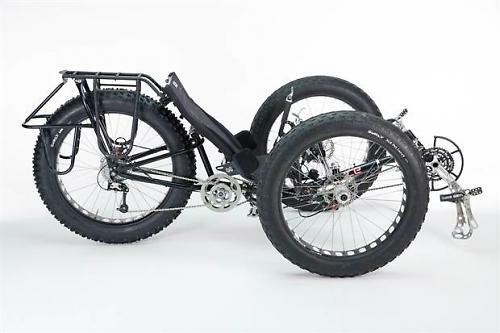 “We have used our knowledge and expertise in bringing together some of our parts from our current trikes along with a few custom built additions to produce a monster that has the capabilities to go the distance,” say ICE Trikes. The frame is ICE’s standard 4130 Cromoly Steel Cruciform with off-the-shelf steering and geometry. ICE’s Ergo-Flow Mesh Seat is standard too, with cushioning in the base and side bolsters to improve comfort. Maria has fitted armrests and uses her sleeping bag as a head rest so her upper body is completely supported. That’s going to be vital because Maria is likely to be on the trike for 18 hours a day. Yep, that’s 18 hours a day. In the Antarctic. The back end has been redesigned especially for this challenge. It’s made from aircraft-grade heat-treated 4130 chromo steel hand brazed in Ice Trikes’ workshops, and it has been specifically designed to handle the forces from the extremely low gearing (see below), especially in low temperatures. The back end has the ability to hold a 4.8in Surly tyre. Yep, that’s 4.8in – over 12cm (more on the tyres in a mo too). Obviously, you need something chunky to provide grip in soft snow. ICE have taken their rack top and sides and produced an extension rack with support stays to provide extra capacity to hold all of Maria’s bags. The rack can hold over 100kg (220lb) although Maria says she is taking 45kg (99lb). Carrying the load over the back wheel has the extra benefit of providing more traction on the slippery surfaces. “The majority of [the] weight loads up the rear driving wheel and in fact reduces the weight on the front two wheels meaning that I might just get some extra float out of my front two wheels,” says Maria. The boom – the extension that the chainset mounts to – is heat-treated 4130 chromoly steel like the frame. Ice have added a curve to it, the idea being to improve the circulation to Maria’s feet. ICE Trikes have taken a standard mountain bike chainset and engineered a mid-drive with an extremely low gear. They’ve designed heavy-duty guards to protect the chainrings and prevent the chain dropping off. The trike is equipped with a Shimano 9-speed cassette, the sprockets ranging from 12-tooth right up to 36-tooth. The mid-drive is a 2:1 step down and the Rotor Q Ring chainset gives a 8.7in bottom gear. This means that Maria has a gear that’s twice as easy as on a normal mountain bike. The chain is a YBN mountain bike chain – or, rather, it’s three of them all hooked up together. It was selected for its ability to handle high forces. The hubs are Hope’s FatSno. They’re specifically designed fat bike hubs so they’re wider than standard , the idea being that they can build up into super-strong wheels. 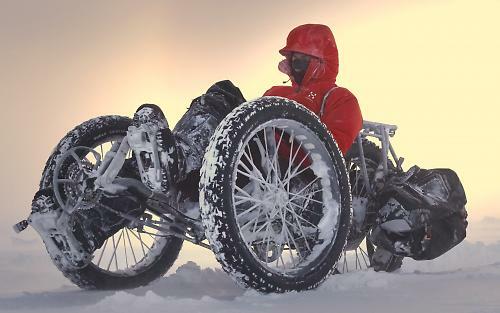 We’re guessing that you really don’t want to take chances with your wheels when you’re heading for the South Pole. Ah yeah, the tyres we mentioned earlier: it’s the rear one that’s 4.8in – a Surly Lou. The tyre is knobbly to provide grip over ice, snow, wet and loose. Those spikes have been added by Maria to provide more traction on ice. The front tyres are from Surly too: Big Fat Larrys. Again, at 4.7in they’re wide so as not to sink into the snow. They come with a tread that’s designed to provide good grip and steering in a variety of conditions. “On top of this we made a custom fit pair of skis for the front two wheels that fit on with a simple brackets system for when the snow is just too deep to make any headway,” says Maria. The trike has active braking on the two front wheels, each brake operated independently with levers on either side of the handlebar. There's also a disc parking brake at the back to stop the trike getting blown away in the night. You can follow Maria Leijerstam on Twitter and she also has a blog. For more info on Ice Trikes, visit their website.